This compelling new look at one of the worst disasters to strike humankind--the Great Irish Potato Famine--provides fresh material and analysis on the role that nineteenth-century evangelical Protestantism played in shaping British policies and on Britain's attempt to use the famine to reshape Irish society and character. Kelly intersperses the nitty gritty of the shifting Irish economic situation with horrific glimpses of its human toll ... Recognizing that the British handling of the famine was “parsimonious, short-sighted, grotesquely twisted by religion and ideology” rather than deliberately genocidal is important because while powerful, paranoid, racist madmen like Hitler are relatively rare, our own time is replete with men like Trevelyan. ... That version of the story may not be as satisfying dramatically and morally as the one with the evil, homicidal Englishman, but it does do what history does best, which is to show us how not to repeat it. "By the summer of 1847, newspaper readers in North America and Europe could be forgiven for thinking the only thing the Irish knew how to do any more was die." That sums up the horrific story of the Irish Potato Famine of 1845-1848ish, a dreadful event that was sadly in need of a new and readable history. That is what John Kelly has delivered -- in spades. He does the world a service by not arguing that the collapsed of the potato crop was artificially manufactured and created by the British with the express purpose of triggering what ended up becoming the equivalent of a genocide of the Irish, nor does he romanticize life in pre-famine Ireland. What he does do is deliver a crisp, well-researched and authoritative history of the cataclysm and its consequences. In Kelly's eyes, the English have a responsibility for the astonishing fatality -- about a million died; another million emigrated -- but it's of a different kind. English policies and especially the commitment to policy ideals rather than the preservation of human life (eg the government determination that no one should interfere with the market's operations by providing free grain or selling below the market price) had an impact that proved devastating. Kelly makes clear that the starting point of their thinking was radically different than what ours might be today, 160 years later: to the English of the 1840s, it was easy to see the famine as a kind of divine judgment, whether on the over-reliance on the potato crop, the antiquated system of barter rather than a modern cash economy, or simply the fact that the Irish were Catholic. To them, the crop failures were a welcome opportunity to reshape Ireland, and the policies that they tried to execute exacerbated the catastrophe. In the wake of any tragedy of this kind, it's easy to slip into the "but they should have known..." analysis -- 20/20 hindsight. That has been particularly true of the famine, which has played a critical role in the thousand years or so of conflict between England and Ireland, so it's not surprising that Kelly does do a bit of that. (Another example of what I mean by this: it's akin to the comments made about Jews in Germany and Austria in the mid-1930s -- why didn't they leave? Didn't they realize?? Kelly occasionally slips into comments along the lines of "they should have realized...") But the deft marshaling of the complicated facts and the juxtaposition of these against some vivid writing (the only other history of the period I've read was very very dry) and an anecdotal style more than offsets this. Many of my ancestors are Irish, although Irish protestants, with names like Duke (Kelly quotes a Co. Leitrim physician, John Duke, who was viewed as a savior by some of his Irish Catholic patients and whose grave marker is still decorated with flowers today) and Casement (yes, as in Roger), but most left before the famine, in the 1820s or 1830s, in the aftermath of the failed 1798 rebellion. Most were themselves small farmers or craftsmen, not peasants, but not landowners. I wish that my g-g-g-g-grandfather Francis Duke had left some mention of what he thought of his great-nephew's actions during the famine, and what he thought of the flood of new Irish immigrants to Canada in the years before his death. What is sure is that the Co. Leitrim he left today has a population that is only about 10% of what it was before the famine -- and that for every person now living here, there are at least 7 or 8 members of the Irish diaspora who can trace their roots to Leitrim. That's an example of the impact of this horrifying few years of Irish history, a period that still affects the sense of what it is to be "Irish", and that country's relationship with England. A compelling, richly layered, vividly detailed chronicle of this horrific catastrophe and its consequences. Gerard Doyle did a fabulous job narrating the audio version. Kelly's book does a fine job detailing the famine years, covering everything from the political to the personal stories. Truly unforgettable. John Kelly is a worthy successor to David McCullough. This book, heavily annotated and footnoted, is a scholarly work with enough flesh and bones to keep it animated. I love the author's sly ironies. For example, the last line of the book describes the mood of a 1848 New Year's party in England thusly: The famine was over and it had had an expectedly happy ending: the Irish people were learning how to help themselves. This is a very thorough history of the Great Hunger in Ireland, which I will never call the Potato Famine again. A potato blight (throughout Europe) caused the crisis, but the famine was caused by misguided, ideologically driven government policy. 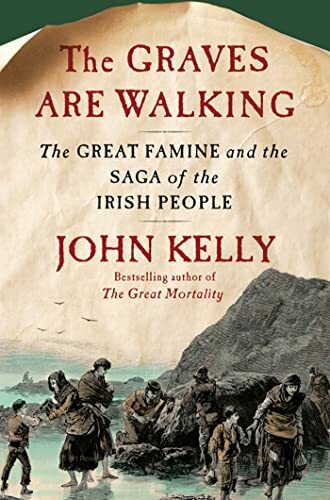 Kelly pushes back somewhat against the theory that the famine was a result of a deliberate genocide, but the tale he tells of incompetence and blind ideology is in a way more chilling, because more apt to happen again.